I have lived and worked in Long Beach, California the past ten years, and while there are a few local reading series, such as the one at Gatsby Books and another recent start-up by liz gonzalez, I usually have to head north to Beyond Baroque or the Armand Hammer to attend a reading. Due to my workload at CSU Long Beach, however, and the age of the vehicle I drive, I have a limited amount of time I can spend on the road. Fortunately, in recent years, I have been able to use my position as a member of the English Department at CSU Long Beach to bring over a dozen poets to campus, and I am grateful for the generosity of these poets in accepting a very minimal honorarium. This weekend, though, the Southern California Poetry Festival is taking place in Long Beach, and I hear that the event is sold out for both days. I myself wish that I could have attended at least one or two of the events, but putting in a request for a ticket has been at the bottom of my “to do” list. With the exception of a lovely, but all too brief visit with Larry and Nancy Goldstein, and the dozen or so hours given to self-contemplation during the UCLA Oral History interviews conducted by Jane Collings, this past summer was devoted to improving the living situation of my 94-year-old mother. The past eight weeks have been especially consumed with that task, and there is no indication of a let-up in the challenges posed by her deterioration. My mother may well recuperate and regain her footing to enjoy the upcoming birth of her first great-grandchild, but I suspect the hard work of being among the very old is even more daunting than she anticipated. My sister, Joni, flew to the United States from her home in Israel about a month ago to lend considerable assistance, and this was her second trip here to help out since the late spring. Of our mother’s half-dozen offspring, we are the pair most currently involved as advocates of her care, as well as the ones most directly giving her solace and nurture. If my blog has lagged at times over the past three years, it is not just the need to give my students the attention they deserve that has caused my absence from posting. My mother has been steadily declining since about 2008, but she has stubbornly resisted acknowledging the encroaching fallibility of old age. She only gave up her driver’s license shortly after turning 90. She had driven over 70 years without ever getting in a single automobile accident, not even one caused by the egregious neglect of another driver. I have to give her high marks for quitting while she had a perfect record in that regard. The closest I will get to the Southern California Poetry Festival, therefore, will be having Laurel Ann Bogen stay over tonight with Linda and me in Long Beach. Laurel arrived earlier this afternoon and has gone off to a movie with Linda to give me some time to read and prepare for classes. I just finished Faulkner’s “Spotted Horses,” which I will teach on Monday with the same pleasure with which I read it once again. I especially regret not being able to hear Jax NTP read this weekend. Jax is a graduate of the CSULB MFA program and I have been delighted to see that she has continued to write and to start getting her work published in magazines such as Larry Smith’s on-line edition of Caliban magazine. I also would have enjoyed hearing the panel discussion on the Poetics of Southern California, featuring Marilyn Chin, Suzanne Lummis. Luis J. Rodriguez, and Ralph Angel, and moderated by David Ulin. In addition to Laurel Ann Bogen, other poets who will be reading this weekend include Gail Wronsky, Robin Coste Lewis, Mike Sonksen, Douglas Kearney, Griselda Suarez, Amy Uyematsu, Paisley Rekdal, Billy Burgos, Charles Harper Webb, Nicelle Davis, Frank X. Gaspar, Brendan Constantine, Sarah Vap, Judy Kronenfeld, and Amy Gerstler. The only scheduled poet who I have heard read before and whose work is not particularly interesting is Henri Cole. Any festival that can have such a high ratio of interesting, vital poets is a major success. I hope all who attend enjoy the weekend as much as I would have, should I have been free. 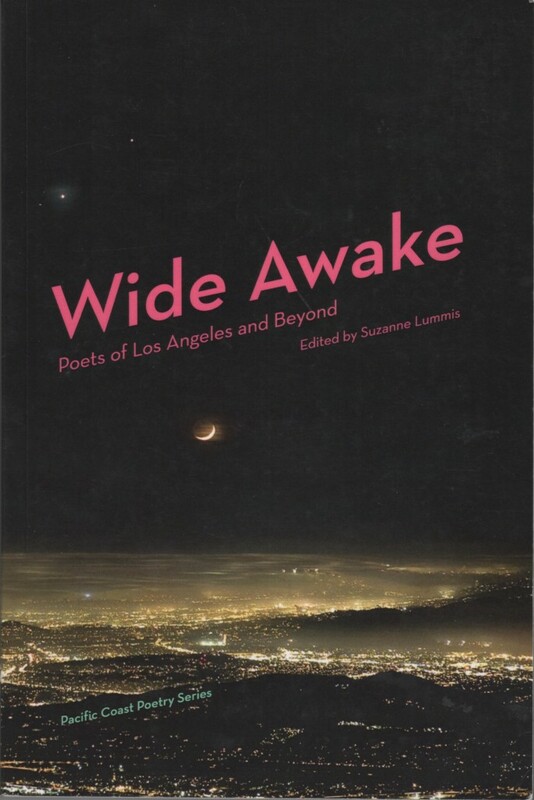 LA Times Book Critic David Ulin has edited several anthologies himself, a fact that deserves underlining when he includes Suzanne Lummis’s Wide Awake: Poets of Los Angeles and Beyond as one of his ten favorite books published in 2015. One doesn’t have to have edited an anthology of poets to gauge the value of such an effort, but it certainly tends to make one a more judicious reader of anthologies. 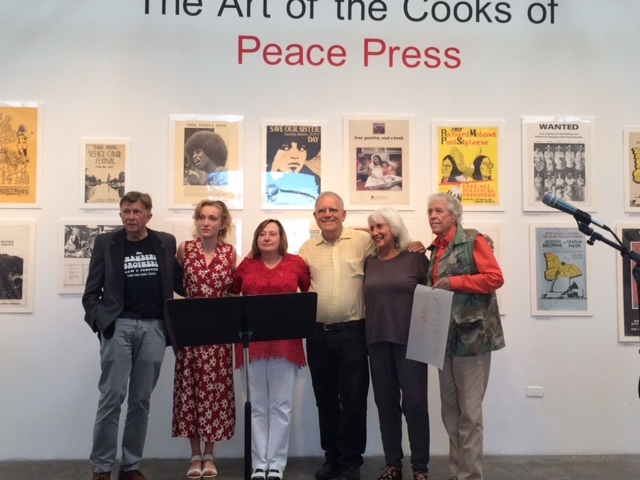 Lummis, too, is a veteran of this kind of editorial project; she co-edited an earlier anthology with almost the same subtitle back in the early 1990s. The high marks that Ulin gives Lummis’s latest anthology are much appreciated in the Los Angeles poetry community, if only because L.A. poets have not always had a smooth ride in the L.A. Times. In particular, one can recollect that Robert Kirsch once anointed my first anthology, The Streets Inside: Ten Los Angeles Poets (Momentum Press, 1978) as an indication of a “golden age” of Los Angeles poetry. Unfortunately, not everybody who worked at the LA Times Book Review agreed with Kirsch’s assessment, and poets were regarded as cultural orphans of their own success. I’ll put it simply: it’s nice to be appreciated again. Ulin implicitly suggests the exponential growth of the diverse scenes here by pointing out that Wide Awake is “magnificent” both in quantity (it contains “the work of more than 100 poets”) and quality (it “reveal(s) the depths and power of the city’s poetic sensibility”). That David Ulin appreciates the efforts of the diverse communities of poets in this city enough to award Lummis’s anthology a top ten pick is very gratifying, and I hope Suzanne Lummis is savoring the acknowledgement. The real gripe that the Swedish academy has with American writing lies in the evidence of its insularity: “They don’t translate enough.” This could be translated, so to speak, as “You don’t care about us; so why should we care about you?” Fair enough, and it brought to mind how I recently found that my most widely distributed posting in this blog for the entire year of 2015 was “Against the Monolingual Torture of Writers,” which was originally posted back in early September. For some reason, it took off in December, and had over 300 pageviews, with 161 human visits, of which 149 were new visitors to my blog. My post was firmly on the side of the Swedish academy, and perhaps it caught the attention of someone in Europe who was surprised to find an American writer at odds with his peers. Fortunately for me, my blog is not dependent on American book publishers for advertising in order to keep itself going. If it were, I could see retribution heading my way lickety-split. Believe me, I’ve seen it happen. The announcement earlier today of the death of Natalie Cole recoiled with references to “Unforgettable,” a song that her father had made famous and which the daughter reprised by having a version in which her voice was blended in a duet with his. Back when the father-daughter version was soaring up the charts, the newspaper I was working at as a typesetter started running cartoons with a slightly satirical edge to them about the music industry. The publisher must have thought it would make his paper “different” from the other trade papers. What he didn’t count on was that you can only get away with making fun of something that everybody shares a dislike of (i.e., politicians). The music industry takes itself very seriously, and when the front page ran a cartoon of Natalie Cole saying to a skeleton figure of her father, “Hey, Dad, you’re stepping on my lines,” (or something similarly sarcastic), the music label that released Cole’s remake let my paper know that it wasn’t just cancelling advertising of that particular song in the next issue or the issue after: all advertising by that label was forthwith cancelled. Or at least that’s the version that I heard in the hallway. I do remember some rather tense editorial and salespeople faces walking past me for a week or so until the crisis was resolved. The first thing to go, of course, was the contract with the cartoonist, nor was a replacement sought. So, yes, once again, it would make American literature more interesting if the writers here asked themselves at some point if what they are writing would at all interest someone who can only read Spanish or Chinese. Are you saying something profound enough or insightfully witty enough to merit the travail required to translate it? I do appreciate how hard it is to attain that level of writing. My first book of poems in another language has only been published after over 40 years of writing. Surely, though, those poets who have won so many more awards that I have during that time have some explanation for why their work does not seem to make a transition beyond the wall of American monolingualism. A reading to celebrate the publication of Wide Awake: The Poets of Los Angeles and Beyond will be held at Beyond Baroque on Saturday, May 9th, at 4:00. According to an e-mail I received this afternoon from Suzanne Lummis, about half of the poets in the book will be there to read one poem each. My MFA students are giving a reading in Long Beach that same afternoon, and I have decided to give the best overall class of students I have ever worked with their well-deserved final round of pedagogical applause. From that day forward, those students will be my peers, and not my subordinates; they have earned the recognition that only my presence that day can bestow. I am certain that the gathering at Beyond Baroque on May 9th will be a boisterous occasion, and I would love to celebrate the latest iteration of L.A.’s most visible poets. I regret especially that I will not be there to hear Liz Gonzalez read her poems. I am fortunate at my age to have a job, however, and doubly fortunate to have such good students. I have cast my lot in Long Beach. Suzanne Lummis has done a solid job in assembling a representative selection of L.A. poets for her most recent anthology, and the book deserves to have a substantial audience. 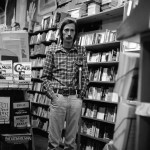 On the whole, though, the book seems to homogenize the various scenes in Los Angeles, so that one has little sense of how disparate the poetics of many poets in this city have been during the past three decades, let alone the past half-century. There have been at least a dozen anthologies of Los Angeles poets since 1960, beginning with “Poetry Los Angeles” (which is not to be confused with Laurence Goldstein’s marvelous study of poems about Los Angeles, published by the University of Michigan Press in 2014). Not one of these anthologies has followed the lead of Donald Allen’s or Ron Silliman’s anthologies and included some critical commentary by the poets that articulates their specific poetics. The need at this point is for a book that has fewer poets and more reflection in prose on the poems. At the risk of being seen as a dour, nostalgic grouch, I have decided that too many poets are absent from Wide Awake not to let the absentees (or their surviving friends and family) know that they deserve to be in some future anthology of Los Angeles poetry, one that will give a comprehensive picture of the 200 best poets to work here since the end of World War II. 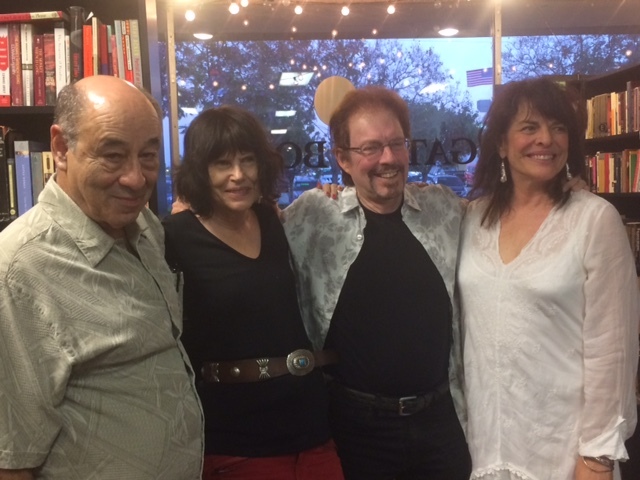 To lead off, I mention Alvaro Cardona-Hine and Jack Hirschman, both of whom were in both anthologies of L.A. poets worked on by Paul Vangelisti in the early 1970s. 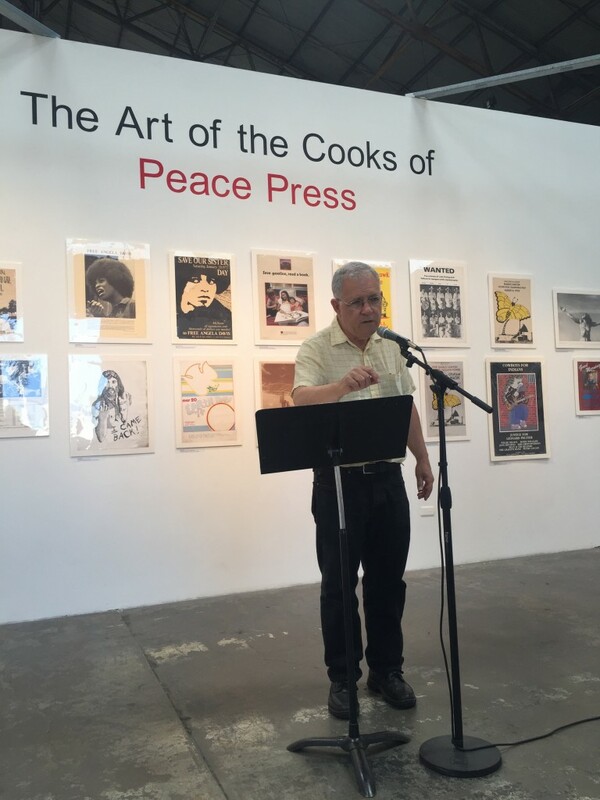 Along with Clayton Eshleman, John Harris, Victor Valle, and Joseph Hansen, Cardona-Hine and Hirschman represent strains of poetry that have made Los Angeles a particularly complicated arena for the contemporary practice of an ancient art given renewed reverence by its most renitent adherents. Let the roll-call commence, and let it be emphasized that this is not some definitive list. I have not listed, for instance, any young poets who have studied with me at CSU Long Beach and who have begun publishing their work. 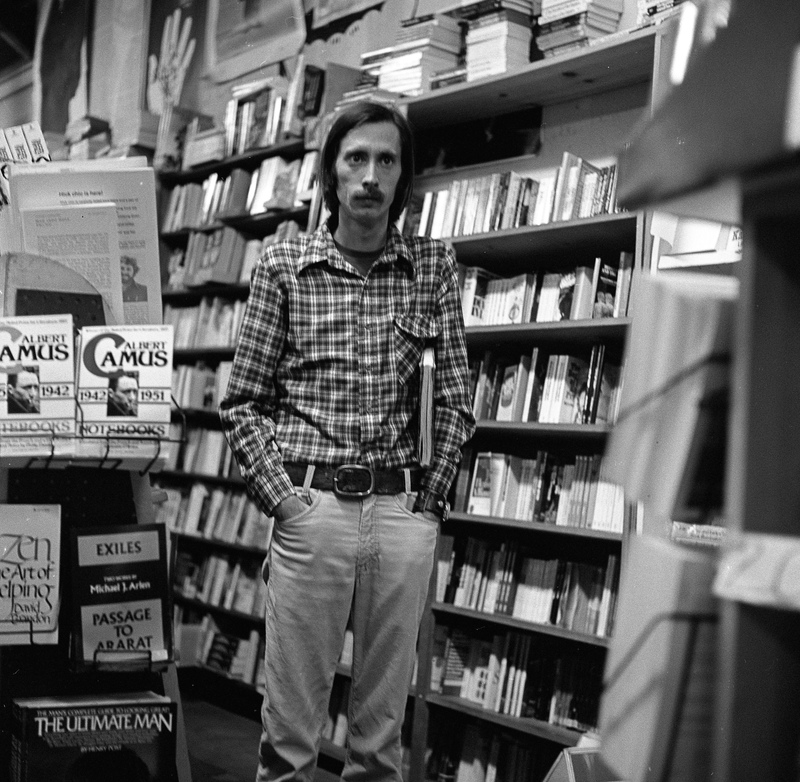 The first time I had any contact with Suzanne Lummis was a short letter passed on to me by Lenny Durso, the last of the three original owners of Intellectuals & Liars Bookstore to be holding out against the onslaught of Crown Books. Suzanne was looking for venues to give a poetry reading; unfortunately, I & L was on its last legs and so she never read there. At that time, she was collaborating with a songwriter, as well as working on plays and doing some acting. Her versatility and talent intrigued me and I was pleased to include her in my second anthology of Los Angeles poets, “Poetry Loves Poetry” (1985). Suzanne has gone on to become one of the major literary activists in Los Angeles during the past thirty years. She has edited or co-edited a series of anthologies, including the first thin volume of “Stand Up” poetry as well as a subsequent collection, “Grand Passion.” In addition, she is co-editing a new anthology of Los Angeles poets to be published with the Beyond Baroque imprint in 2015. As a poet, she has not gotten anywhere near the attention that she deserves. Her first full-length collection, “In Danger,” was more than strong enough to expect that other presses would have solicited the next manuscript. Instead, her work has languished in that peculiar zone of incomprehensible marginality that frequently seems to be the birthright of many poets working in Los Angeles. Nevertheless, her writing has continued to gain widespread respect; in fact, as a successor to the wonderful poet, Eloise Klein Healy, Suzanne Lummis would have been my choice for the second poet laureate of Los Angeles. Finally, though, 15 years after “In Danger” was published, her second substantial collection has been published. “Open 24 Hours” won a contest sponsored by Blue Lynx Books and the book is now available at Beyond Baroque Bookstore as well as the on-line outlets. Suzanne has just had another break-through occasion, too, in having a poem appear in “The New Yorker.” On one level, of course, such a standardized level of accomplishment is not something that changes my opinion of her writing, which I would respect no matter if she collected 184 rejection letters in a lifetime of submitting to that magazine. On the other hand, she should be justifiably proud of getting printed there. If Rae Armantrout feels comfortable about having a poem in “The New Yorker,” then why shouldn’t the rest of us lounge by its poolside, too? Rae’s poem, “Before,” which appeared in a mid-December, 2013 issue, is worth looking up. she wasn’t me. Small wonder, though, they jumped. A number of things happen here that have the touch of a chess master handling the opening gambit and its and counter-moves, not the least of which is how the diction and colloquial syntax pull the reader close for a moment of sneaky intimacy. The voice is more reflective than one might find on a dramatic stage, and yet what’s at stake is equally compelling. The use of blank verse in a nine-line stanza (but without any Spenserian rhyme scheme) is impressive. I particularly admire the spondee of the third foot of the second line and would argue that this accentual nuance (SMALL WONder) is exactly what underscores the irony trembling throughout the poem. That spondee, in turn, can only be fully appreciated if one notes that the placement of the caesura in the poem’s first line is not necessarily in the “obvious” place (after “found”). The fact that there is not a comma after “found” is a clue that the caesura’s placement is more open to interpretation than the naive reader might think. If the caesura is placed after “ensconced,” one magnifies the sense of a fateful anticipation being fixed in certainty, as opposed to the counterpunch of the opening of the second line: “she wasn’t me.” In other words, the sense of displacement in the narrative gets underscored by the spot, in the first line, where the hemidemisemiquaver of an internal pause gazes inward at itself. I have my doubts that anybody who wrote to Suzanne to congratulate her on the poem commented on her metrical tactics, but if Suzanne has brought her knowledge and skill to the task, then it deserves some measure of specific commentary. As is often the case, I wish I had more time to extend my analysis. This is merely a start on her poem’s subtle effects. I urge all of you to turn to it with ears wide open. Laurel Ann held her annual holiday party for her workshop students and a few of her oldest friends yesterday. Dylan Thomas’s recording of “A Child’s Christmas in Wales” regaled us as a ritual opening of the occasion that never wears out the jostling oscillations of its lyric impetus. This year, I heard how the words “distant” or “distance” appear several times in the story, which made the final chord of “close and holy darkness” all the more resonant. Towards early mid-afternoon, when many of her guests had departed with their “secret santa” gift exchange (Amelie Frank being the happiest of that cluster, and Thom almost equally delighted), Laurel Ann asked if I had heard the news about Suzanne’s book of poetry. “You mean her book that Red Hen’s putting out a couple years from now?” “No,” said Laurel. “Suzanne won the Blue Lynx poetry prize and her book will be out in September.” I was delighted to hear this news, as I knew from a phone conversation with Suzanne how much a full-length book was needed as a way of clarifying her distinctive blend of “stand up” and “noir” poetics. I first heard of Suzanne shortly after she arrived in Los Angeles. She wrote to Intellectuals & Liars Bookstore in Santa Monica and asked for a reading, but the store was closing up. I don’t remember at this point where I first heard her read, but her poems impressed me immediately and she easily earned a spot in “Poetry Loves Poetry” (1985). I hope that “Open 24 Hours” secures some significant and much deserved critical attention for Suzanne’s poems. One problem will be that reviewers will be unlikely to have a copy of her first full-length book, “In Danger,” to use as a point of comparison. Any book that costs over $30 to buy a used copy of on Amazon is obviously out of print, so unless a reviewer is living near one of the 85 libraries in the United States that have a copy of it, she or he is going to be at a wretched disadvantage in calculating the importance of Suzanne’s new volume. The lack of willingness on the part of many libraries (including CSU Long Beach’s) to sustain any semblance of interest in contemporary poetry remains one of the great scandals of American culture. The reality is that many living writers have better personal libraries of contemporary poetry than most public libraries. One can only hope that Suzanne’s book get enough attention to merit a second and third printing and thereby ends up on enough private bookshelves to make future reviews of her poetry more knowledgeable about its trajectory. The sad truth is that I just checked “World Cat” and it does not appear that Lynx House has any more luck in getting its titles by poets into libraries than Heyday Books. Lou Lipsitz, whose early book “Cold Water” remains one of my favorites from 40 odd years ago, had a recent title come out from Lynx House, “If This World Falls Apart”; only 88 libraries pop up on the World Cat listing. Laurel graciously allowed Linda and me to make use of her apartment as a way-station during the late afternoon. 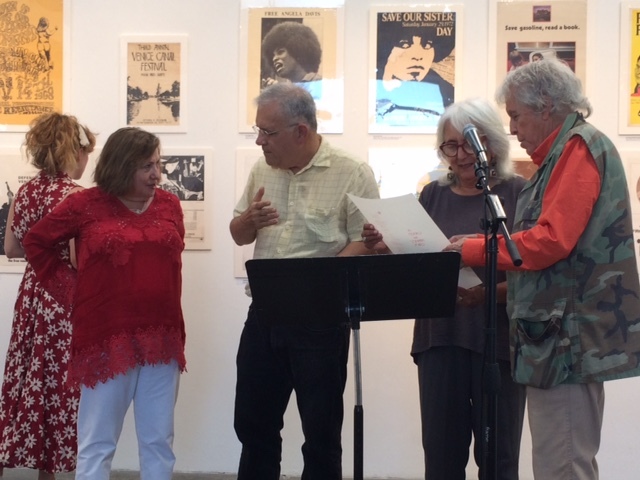 Mel Weisburd had invited me to attend his presentation at Beyond Baroque yesterday, which had its starting time inexplicably moved from 7 p.m. to 8 p.m. (Even more odd was how Michael C. Ford’s event with Phoebe MacAdams and Renny Golden found itself upstairs at the same time.) Despite the late start, Mel’s slide show attracted an audience of about 30 people, not all of whom were close to his age. Of the younger people who heard off-hand comments about Bert Meyers’s tendency to borrow people’s books without permission, I wish to thank Robert Herrick for introducing himself to me in the Beyond Baroque bookstore, just after I purchased a copy of Stefi Weisburg’s “The Wind-Up Gods.” He mentioned having gone to Susan Wiggins’s acupuncture clinic as a result of reading about it in my blog. This is the first time that I’ve actually had a sense that someone I didn’t know was actually making use of this late-blooming foray into an electronic diaspora. 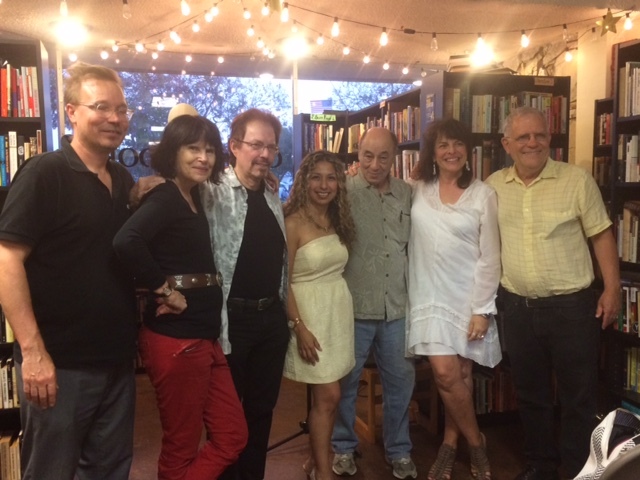 I was delighted to hear Stefi read Bert Meyers’s poem, “L.A.,” which remains a classic of urban remonstration. Most of Mel’s talk covered ground that was very familiar to me, though I had never seen many of the photographs he showed. It was a pleasure to hear Gene Frumkin’s work talked about with affection and respect and I only wish there had been time to talk more about Alvaro Cardona-Hine. Yesterday was the 33rd anniversary of John Lennon’s death. For some reason, I never thought about the overlap of the date (December 8) with the Feast of the Immaculate Conception, which was regarded as a holy day of obligation in my childhood religion, Roman Catholicism. It’s a mark of how difficult it is to free oneself from early temporal cycles in that I almost always think of that religious holiday when 12/8 rolls around. It’s Lennon’s death, though, that remains a wound far more profound that the assassinations of the Kennedy brothers. Linda and I drove home as soon as it was over, and we were both grateful that traffic was flowing well, since even so, it was past 11 p.m. by the time we turned on the heat to warm up the house before we quickly fell asleep. We had encountered over 60 years worth of poetic history, including the up-to-the-minute developments, and we were grateful for our accommodations, transient as they might be.